The Leavenworth area stands out for both the cultural attractions of the town itself and the wide range of outdoor activities that the surrounding area provides. Huckleberry Cabin allows you to experience the perfect mix of these two worlds while still providing a quiet retreat spot that proves to be rustic and cozy. Being only 20 minutes away from downtown Leavenworth, you're close enough to enjoy the ongoing activities, yet far enough to relax peacefully. Standing at the back of the cabin provides you with a view over the wooded hills, a private backyard pond and the chance to breathe in the quiet solitude that this location provides. The inside of the cabin is complete with two baths and three bright, but cozy bedrooms that are sure to feel comfortable at anytime of the year. Explore the spacious dining and living rooms that round out this location and embrace the tranquility that it provides. Bring your own canoe or raft to paddle around the pond. Enjoy the seasonal fire pit or just relax under the shade of the trees. For a more relaxed day, take a dip in the backyard pond, stroll around the property, and appreciate the feeling of being away from it all. 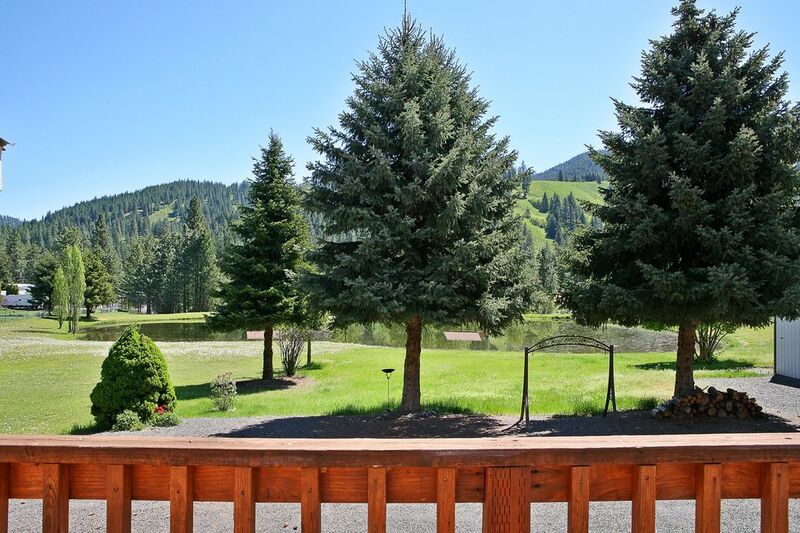 Thinking of booking one of our homes in Blewett Pass? Do it! We know you won't regret it because the ways you can spend your time here are absolutely endless. Blewett Pass is a mountain pass that's apart of the Wenatchee Mountains - meaning that you will be right there! Right there are the mountains, the towering timber forests and you're only a short drive away to downtown Leavenworth where the spirited Bavarian Village will be sure to delight you. Winter months bring skiing and snow shoeing opportunities as well as the Christmas events in town - caroling, tree lighting and much more. Spring and Summer means trail hiking, wild life watching and the beautiful blossoming trees and flowers. Hello Guests, Our family has owned Huckleberry Cabin for many years. Together we have cross country skied and sledded in the winter time and hiked the hills, canoed, swam, and had many fun family gatherings in the summer. It is been our "peaceful place" to go to when we need to unwind and reconnect. Our hope is that you, too, will experience God's peace as you enter our home. Rest, relax, play, and enjoy your stay at Huckleberry Cabin. Blessings,. Jeff, Shellee, Tonya, Emily, Jenny, and Sarah. House is nice and well kept. The property and location were perfect! I will reccomend this cabin to all my friends. We had a wonderful time, and it is dog friendly. We enjoyed our stay so much. Super clean. Quiet neighborhood and perfect for families. We loved it! Great home for a family or couples to share outside of Leavenworth. All the comforts of home. Large table for our family games. We will definitely return if we come back this way. Cabin was very clean and cozy. The Huckleberry cabin was very clean and cozy. The 15 minute drive to Leavenworth was very manageable especially with mild weather conditions. This was a lovely home and provided more than enough space for our party of 4. All the games available were a very nice touch for a snowy evening in! Great location, and a nice, quiet neighborhood. My family had a great time.